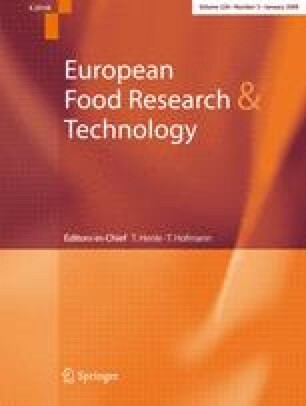 Chromium (Cr) availability (expressed as percentage dialysed Cr) in breakfast cereals (n = 93) was evaluated by an in vitro method of simulated human gastrointestinal digestion followed by GFAAS measurement of dialysed Cr. The dialysed Cr ranged from 0.48 ± 0.07 to 3.26 ± 0.04%. The Cr dialysability was independent of the total amount of this mineral in the breakfast cereals. Correlations between chromium and other breakfast cereal components (lipids, carbohydrates, minerals, vitamins) were also studied. The dialysed Cr values were significantly correlated with the total and unsaturated lipids (p < 0.005). Such other food components as starch, sucrose, fibre, proteins, and various micronutrients were not significantly correlated with the dialysable Cr.